In medium bowl, mix Peanut Sauce ingredients. Cover; refrigerate until ready to serve. Heat oven to 400°F. Spray large cookie sheet with cooking spray. In shallow bowl, beat egg. In large reasealable food-storage plastic bag, place bread crumbs and peanuts. Dip chicken into egg. Place in bread crumb bag; seal and shake to coat. Place chicken on cookie sheet. Bake 15 to 20 minutes, turning once, until chicken is no longer pink in center and bread crumbs are golden brown. Serve with sauce. 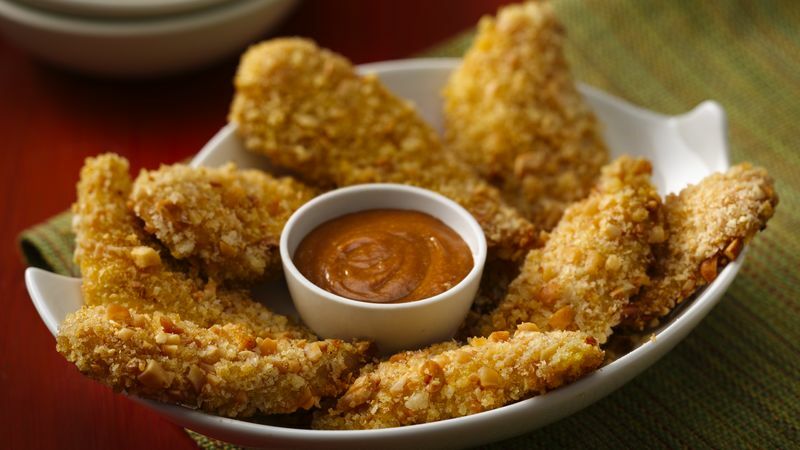 If you like a more crunchy texture, use crunchy style peanut butter in the sauce.